Our good friend Jerry has a chocolate company called Jer's Handmade Chocolates. His company has one of those really great stories about how it was founded, and it sure has been fun seeing his company grow. One of his most popular chocolates is the Pretzo Change-O, a candy that incorporates baked pretzel bits and peanut butter within chocolate. 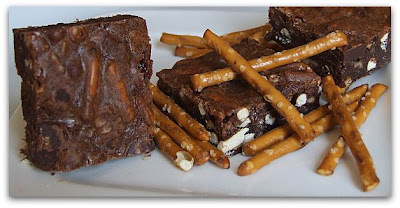 Knowing how tasty those candies are, I decided to try and incorporate salted pretzels into a fudgy brownie recipe: Pretzel- Toffee Chip Brownies. I've seen Fleur de Sal topped on truffles before, so I knew it wouldn't be that much of a stretch to pair the salty/sweet in a brownie. Toffee bits and pretzel pieces within made for a thick batter. I spread it out evenly in a half-sheet pan and baked it up. As usual, my experiment went to the teachers and my family. And what did they think? Well, I'd have to say that they liked them very much. I did too. The pretzels did not stay hard and crunchy- nor did they turn into mush. 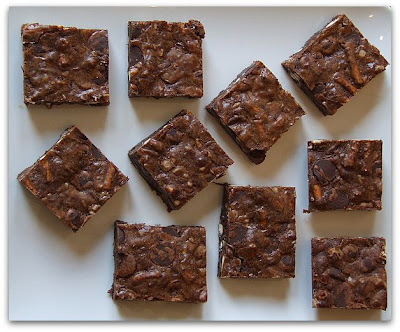 Instead, they held a nice form and added a bit of salt flavor and a slight crunch to the brownie. With a bag of bittersweet chocolate chips added to the batter just before baking, they definitely turned out to be a very fudgy, chocolatey treat. And they were even better with a little scoop of vanilla ice cream and a drizzle of caramel sauce. 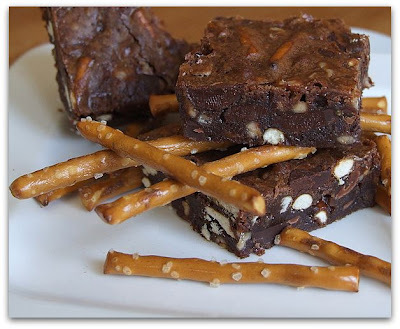 The base of this brownie recipe came from a 2007 San Diego County Fair Cookbook (it was a grand prize winner), but I changed the recipe rather significantly to make it my own. The original recipe called for white chocolate chips, which I'm not always terribly fond of. I think the Ghirardelli folks would have awarded this one the grand prize had I entered. Darn. I could have used that 25 bucks.